Beetiful designed the book cover for the Summer In Diamond Bay Complete Bundle by Maci Grant. This bundle includes all 5 books in the cozy mystery series. 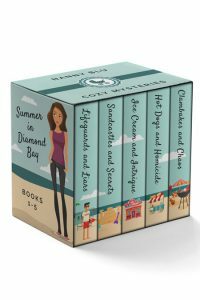 Beetiful designed the book covers to the complete Summer in Diamond Bay series: Lifeguards and Liars, Sandcastles and Secrets, Ice Cream and Intrigue, Hot Dogs and Homicid, Clambakes and Chaos and the Summer In Diamon Bay Complete Bundle. 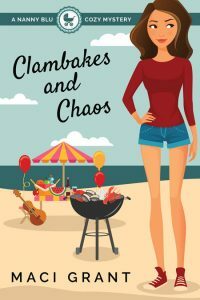 Blu Parker, nanny extraordinaire, is on a mission to make this the best summer ever for her and the two kids she cares for—something that’s not difficult to do in the sweet little beach community of Diamond Bay. 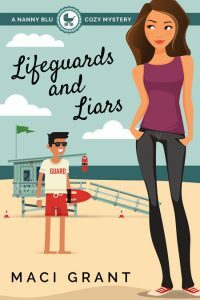 Unlike many of the other younger nannies, twenty-eight-year-old Blu hardly notices Mr. Hottie lifeguard…until she gets news of his death one morning—and then, what’s described as an accidental drowning, is all she can think about. The local police chief is about to meet one determined young woman, who isn’t only interested in getting her summer tan. Nanny Blu’s curiosity and natural instinct for justice will have her seeking out more than play dates as she finds herself firmly involved in the middle of the investigation. Summer has kicked into high gear in Diamond Bay. Nanny Blu Parker has already spent countless hours on the beach with the kids, and they’re starting to complain of boredom. 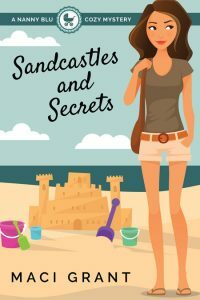 When a chance to enter the local sandcastle competition presents itself, they’re fully onboard—especially when Blu finds out that it’s being hosted by her favorite resident bartender. But before the contest can even begin, one of the expert—and more than slightly awful contestants—ends up six feet under…the sand, that is. 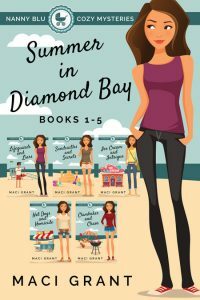 Summer in Diamond Bay means many things to Nanny Blu and the kids she cares for—long days at the beach, picnic lunches in the park and lots of ice cream! 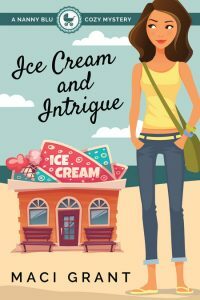 Peddles’s Ice Cream Shop, their favorite place to indulge, can always be counted on for fun new flavors and the kind faces of its owners, until one day everything comes to a grinding halt. One body found by a dumpster, one wrong man in jail and one relentless nanny on a quest to find a killer will leave the residents of Diamond Bay shaken and confused about what has happened to one of their own. 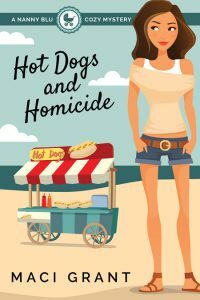 If it’s true what they say about the third time being a charm, Chief Pitman will finally take Nanny Blu seriously—but three murders already in one summer?! Blu’s quiet summer by the beach sure has gotten interesting. Nanny Blu loves to take the kids to the lighthouse in Diamond Bay. There’s a bit of history inside, the view is gorgeous and the kids love to eat the hot dogs from the stand out front. During one particular ordinary visit, screams erupt and Blu hurries the children away just as she sees a body being covered outside. Why a man would jump to his death is the disturbing initial question in Blu’s mind, but after she finds herself involved once again in one of Chief Pitman’s cases, the real question becomes one of a murder. It’s that time of summer again! Preparations for the annual end of summer clambake are in full swing in Diamond Bay. …and the Chief’s nephew, AJ, works tirelessly to collect on the date that’s been promised him by Blu. But can he convince her to take a chance on him? Can he convince her that the end of summer and her move back to Manhattan, doesn’t have to mean an end to their budding romance? 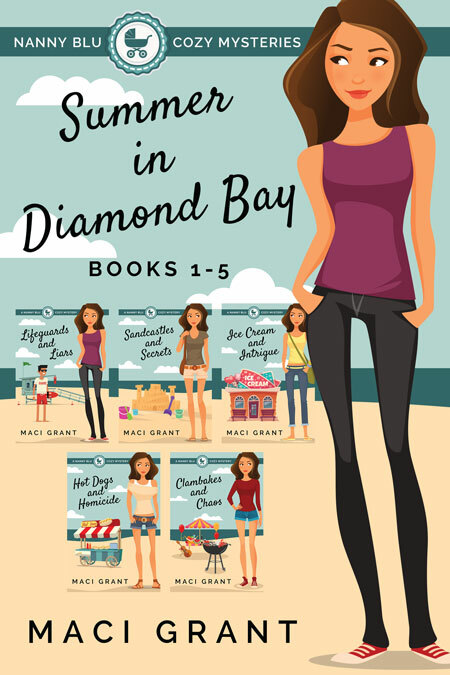 Get Summer in Diamond Bay Complete Bundle by Maci Grant today!